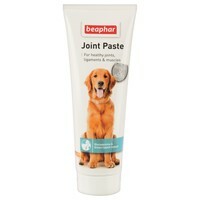 Beaphar Joint Paste is a delicious, easy to administer combination of natural ingredients, which has been developed to help your dog have healthy joints, ligaments and muscles. It also aids the development and maintenance of tendons and connective tissues. Glucosamine – Assists the production of cartilage and in turn rebuilds joint tissue allowing for smooth movement of joints and ligaments. Green Lipped Muscle Powder – A rich, natural source of chondroitin, which will help to maintain healthy cartilage and provide anti-inflammatory effects within joint tissue. Vitamin C – Supports a healthy immune system, contributes to collagen formation and normal function of cartilage. Vitamin E – Protects the cells from oxidative stress. Oils & Fats, Milk & Milk Derivatives, Molluscs & Crustaceans (Glucosamine Hydrochloride 9%, Chondroitin Sulphate 4.1%, Green Lipped Mussel Powder 0.4%), Meat & Animal Derivatives, Cereals, Minerals. My 12 year old Border Collie eats Joint Paste as if it were a treat, and it keeps him active despite arthritis in his front paws. Wonderful stuff!